Horizon Landscape & Irrigation has the capability and skilled staff to coordinate and properly install the full scope of your landscape project large or small. For 35 years, we have given property owners, managers, Builders and General contractors our professional advice on scheduling, project management, installations and cost-effectiveness. 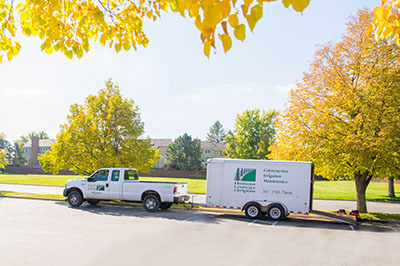 Horizon Landscape & Irrigation is a multi-faceted commercial landscape & irrigation service that includes planning, installation and maintenance for businesses big and small. Horizon Landscape & Irrigation can help you develop and install a work place frontage that is within your budget and still be inviting. When choosing a commercial landscaper, look for one that communicates well with you. Here at Horizon Landscape & Irrigation we will contact you via voice or email on a regular basis to keep you informed on the status of the project. Horizon Landscape & Irrigation we are proactive about potential opportunities and problems. We pride ourselves on our customer service and communication because you, as the owner or manager, deserve to be kept informed. Let our 35 years of experience work for you. Commercial Maintenance Projects Enlisting the professional services of our experienced maintenance division ensures your property will looks its best all year through. Added value year by year is the result of comprehensive, regular attention from our qualified and dedicated staff. Our Account Managers will oversee your property to ensure that you are receiving the most from your property investment.